Overview - The story of a great rivalry between a father and son, both eccentric professors in the Talmud department of Hebrew University in Jerusalem. The son has an addictive dependency on the embrace and accolades that the establishment provides, while his father is a stubborn purist with a fear and profound revulsion for what the establishment stands for, yet beneath his contempt lies a desperate thirst for some kind of recognition. The Israel Prize, Israel's most prestigious national award, is the jewel that brings these two to a final, bitter confrontation. We all want recognition. Even if it's as small as a pat on the back or a shiny gold star, human beings constantly crave approval. No one wants to be overlooked, to be forgotten, to be under-appreciated. Poor Eliezer Shkolnik knows exactly how it feels to be "unjustly" ignored. At least, that's how he interprets his constant lack of recognition. 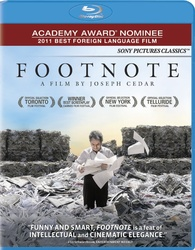 His son, however, is no stranger to awards, setting up the humorous, bitter conflict that rests at the center of Joseph Cedar's 'Footnote.' Nominated for Best Foreign Language Film at the 84th Academy Awards, the movie weaves a deceptively simple tale that is full of moral ambiguity and thought provoking questions. Bolstered by some creative stylistic touches, the director engenders a truly fascinating ethical dilemma that leads to clever comedy and heartbreaking drama. The story follows a rivalry of sorts between a father, Eliezer (Shlomo Bar-Aba), and son, Uriel (Lior Ashkenazi), who are both professors in Talmudic studies (Jewish law, philosophy, culture, etc.). While Uriel is quite popular for his modern approach to research and his charismatic personality, Eliezer adheres to old-school principles and refuses to adapt to changing times. Constantly overlooked for various awards in his field, Eliezer has grown bitter and resentful of his son's success. This could all potentially change, however, when the stubborn old man is informed that after decades of submissions, he's finally won the coveted Israel Prize. Elated and seemingly vindicated, Eliezer's ego inflates, but an issue arises that brings his award into question. Faced with an impossible ethical quandary, Uriel must decide between truth and compassion, holding his father's fate in his hands. In many ways, the narrative is really quite simple, but the central moral dilemma that rests at the heart of the story is infinitely complex. Densely packed with grey layers upon grey layers, the tough situation that father and son find themselves in is simply cringe worthy. There are no right or wrong answers, simply choices, and the characters don't come to them lightly. Uriel's ethical struggle hits upon fascinating concepts dealing with pride, compassion, and truth, fostering thought provoking questions that have no easy solutions. Indeed, by the time the credits roll, certain plot threads are left unfinished, and the film's abrupt conclusion remains appropriately cryptic and ambiguous. While this might leave some viewers unsatisfied, in this case, I feel that the vague ending is quite fitting, and works well to enhance the story's tone and intentions. As potent as the drama can be, the film is also home to a quirky sense of humor that works to playfully undercut but not diminish the narrative's emotional impact. Creative blocking and staging, in particular, become a frequent source of hilarity. One scene, which features a very serious discussion between Uriel and the Israel Prize committee, is set in an almost absurdly small room. The constant cramped maneuverings the characters are forced to make are hilarious, simultaneously enhancing the dramatic tension while still comically deflating the otherwise dire situation. Other silly bits -- like a scenario that involves Uriel losing his clothes and being forced to wear a fencing uniform -- all add a faintly ridiculous quality to the proceedings, but the comedy is never really over-the-top. Instead, the filmmakers offer an understated style of humor that perfectly complements the occasionally solemn drama. In addition to his comedic touches, director Joseph Cedar brings a few interesting stylistic flourishes to the picture. Early on we are treated to a kinetic on-screen rundown of both main characters, presenting visual bullet points that describe their lives, personalities and behavior. These quick bits effectively set-up father and son, telling us everything we need to know about them in a fun and economical way. Close-ups are used to emphasis specific beats, and Cedar likes to hold on particular moments, drawing out the dramatic and comedic tension. An early scene that focuses on Eliezer's reaction to one of his son's acceptance speeches is a perfect example. Throughout the entire speech, Cedar stays fixed on Eliezer's expression without cutting away, and his increasingly annoyed and bitter face is absolutely priceless. The camera slowly pushes in on the grumpy man as his jealousy and resentment boil up, subtly enhancing his on screen emotions through cinematic form. Another notable sequence features some fantastic cross-cutting between father and son, perfectly juxtaposing their dueling predicaments. Likewise, the movie's climax -- which involves a sudden realization by Eliezar -- is full of flashy editing techniques and visual touches that work to place us within the character's mindset. Oscillating between suitably restrained scenes focused on verbose conversations, and more showy instances of visual panache, the director balances the film's tone and aesthetic brilliantly. The father/son dynamic is examined in full force, and Lior Ashkenazi and Shlomo Bar-Aba are both incredible in their roles. Ashkenazi lends Uriel a likeable sense of charm and compassion, but still keeps a certain undercurrent of pride and vanity beneath the surface. The sequence in which he defends his father's life's work is incredibly powerful to watch, and the actor pulls off his frequently loquacious scenes with a palpable sense of frustration and empathy. On the complete opposite end of the spectrum, is Bar-Aba. As Eliezer, the actor crafts a character that is incongruously sympathetic and detestable. Grumpy, resentful, and quite sad, the poor man wants nothing more than recognition for his hard work, but when he finally gets it, the full breadth of his fragile ego is exposed leading to blinding hubris and heartless cruelty. Full of odd little quirks and nuanced mannerisms, the performance is richly textured and multifaceted, creating a character that is truly unique and memorable. Throughout the film, his pain and joys engender laughs and heartache, and the actor does a phenomenal job of handling the shifting tones. In a very interesting scripting and directing choice, both performers actually share very little screen time together. Instead, it's as if they exist in completely separate worlds, furthering the ideological gap between their competing methodologies and the tragic rift in their personal relationship. We all want acknowledgment, but what happens when that recognition is suddenly distorted into a damning condemnation? What happens when the joy of validation becomes a lie -- a silent punishment? 'Footnote' tackles these questions with a delightfully funny but still intellectually complex story that is utterly absorbing. More of a deep and humorous character study, than a traditional narrative, the movie is actually quite simple, but the ethical dilemmas it examines are richly layered. Love, spite, egotism and the all powerful wrath of truth mingle together to form an emotionally resonant tale about a man living in the eclipsing shadow of his progeny, and a son coping with the stinging contempt of his father. Open-ended and ambiguous, the climax is full of bitter irony. We are left unsure how the plot will resolve, but Cedar wisely knows that he's taken us exactly as far as we need to go. While poor Eliezer may or may not forever remain a mere footnote, the film itself is a truly commendable achievement worthy of more than a few accolades. Sony brings 'Footnote' to Blu-ray on a BD-50 disc packaged in a keepcase. After some skippable trailers the disc transitions to a standard menu. The packaging indicates that the release is region A coded. The source print is in perfect shape and there is a light sheen of grain visible throughout. Clarity is on the soft side, but close-ups reveal solid fine details in facial features. The color palette is often slightly desaturated and frequently tinged with blue and teal hues. While this stylized appearance can make skintones look a bit sickly at times, it's all in line with the director's chosen aesthetic. Contrast levels are good and blacks are deep and inky (though shadow detail can be just a hair crushed in some shots). 'Footnote' doesn't offer a lot of pop or depth in its image, but the video presentation is still quite good. I didn't detect any notable artifacts, and the director's sometimes inventive visuals all come through nicely. The audio is presented in a Hebrew DTS-HD MA 5.1 track and a dubbed Portuguese DTS-HD MA 5.1 track. Optional English, English SDH, French, Portuguese and Spanish subtitles are also included. Though frontloaded, the mix is inventive and multilayered, enhancing the story during key moments. Speech is clean and clearly audible throughout. The sound design itself is quite creative, often putting us within the actual headspace of the characters through specific effects. Eliezer will frequently wear noise reducing ear muffs in order to block out distractions, and when this happens, the track follows suit, artistically muting background ambiance in a subdued vacuum of sound. The quirky score has an almost cartoon quality, and while this might not seem appropriate at first, it's actually perfect for the material. Specific music cues highlight various comedic and dramatic beats with great fidelity and separation, without ever upstaging the narrative. Dynamic range is wide, giving ample breath to delicate and aggressive sounds. Tiny effects like heavy breathing are distinct and appropriately soft, while more explosive moments (a racquetball bouncing off a wall, drums beating) are packed with power. While the sound design itself is quite inspired, surround activity is restrained. Still, ambiance does make its way to the rears, and there are isolated bursts of immersion peppered throughout. Balance is mostly good, but the score is mixed a little high for my tastes. With its creative sound design, the mix artistically complements the script and visuals nicely. Though the soundfield can be rather quiet and small during specific stretches, the track demonstrates decent variety and absolutely explodes when it needs to (a scene involving one character's epiphany is particularly impressive). There are some minor balance issues, but overall this is a strong audio presentation. Behind the Scenes of Joseph Cedar's Film Footnote (SD, 24 min) - Presented in Hebrew with hardcoded English subtitles, this is an interesting look at the movie's production. Interviews with the cast and crew are provided along with behind-the-scenes footage. Details on the film's themes are discussed along with character analysis. The actors reveal how they became involved with the project and the director comments on the unique score. Filled with some amusing on-set footage (Lior Ashkenazi frequently forgets his lines), the featurette offers a bit more than your standard promotional fluff. An Evening with Joseph Cedar (HD, 10 min) - Presented in 1080p and Dolby Digital 2.0 sound (in English) this is a Q&A with the director that was conducted at the Toronto Film Festival. Cedar traces the story's origins (a similar real life event actually inspired the script) and offers insights on the casting process and musical score. Theatrical Trailer (HD, 2 min) - The film's theatrical trailer is available in 1080p and Dolby Digital 5.1 sound. Ironic, humorous, and absolutely absorbing, 'Footnote' presents a deceptively simple, deeply layered story about fathers and sons. Through their rivalry, writer/director Joseph Cedar creates a thought provoking moral dilemma. Though intentionally ambiguous, the ending brings us to an appropriate climax, leaving the story's ultimate resolution in the hands of its viewers. Both the video and audio presentations are very good with no major problems. While special features are disappointingly sparse, the included featurette and Q&A are informative and interesting. Fueled by an intelligent script, creative direction, and an authentic technical presentation, this is a good disc for a great film. Highly Recommended.